Custom Imprinted MVP Sports Sunglasses are coming in 2 color options, Blue and White. These custom sunglasses are an excellent giveaway for parties, celebrations and other outdoor events. They consist of an imprint size of 1 1/4" x 1/4" which gives your brand logo maximum visibility among the crowds. One size fits most adults, along with the standard imprint option in the left arm, you can also pick right arm as an alternative imprint option. Order these custom sports sunglasses today to win free professional design and free online proofs facilities. 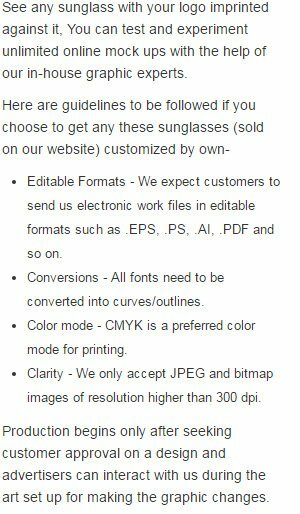 Request a quote to know what you can save on ordering these Custom Imprinted MVP Sports Sunglasses in bulk.